In the U.S., "currants" often mean Zante currants (a.k.a. dried Corinth grapes) that are more or less just small raisins. Fresh black, red, or white currants aren't widely available, but worth seeking out if they're grown near you. Dried black currants are also made and sold. They look a lot like Zante currants, yet are even smaller. Many people think they taste way, way better, with a deeper, berry-rific flavor, and they are often used in scones, buns, and tarts. Real currants are members of the Ribes family of flowering shrubs. These small berries are delicious when eaten fresh. They vary in color from deep dark purple to brilliant ruby red to an almost translucent white. All varieties have a bright acid kick to balance out their sweetness, and a fair amount of tannins that can make your mouth pucker. Use them fresh in fruit salads, particularly berry mixes, or to garnish desserts with their pretty color. Fresh currants aren't always easy to find in the U.S. Look for them at farmers markets and specialty stores—they are sold still on the stem, like on-the-vine tomatoes, often nestled in cardboard produce boxes like figs or berries. They're in-season during the summer, much like berries, and will often be sold alongside blueberries or blackberries. Currants are quite common in French cooking. Fresh currants can be used like blueberries, and somewhat like blackberries or raspberries, in tarts and pies and other desserts, including blackcurrant sorbet or red currant tarts. Alternatively, use them in puddings, such as the famous Danish Red Currant Pudding. Black currants are also delicious used with game, often cooked into a simple sauce and paired with duck or venison. 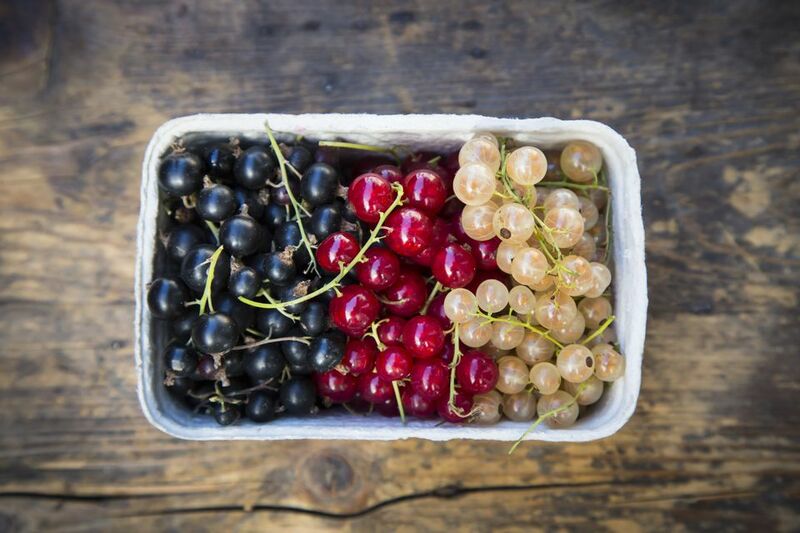 White currants are more delicate and most often used, by those who can find them, fresh. Like all berries, fresh currants have a relatively short life-span. They are best stored loosely wrapped or covered and chilled. Rinse fresh currants dry just before using them, and gently pat them thoroughly dry with a clean towel. As with all berries, don't wash them ahead of time—the exposure to the extra moisture will just shorten their lifespan, causing them to mold or rot in the fridge. For longer storage, currants can be frozen just like other berries: lay them in a single layer on a baking sheet, freeze until frozen, transfer to sealable plastic bags and keep frozen for up to six months. Red currants are commonly preserved, particularly as Red Currant Jelly or Strawberry Red Currant Preserves. Red currant preserves of all sorts are most commonly used with pork, lamb, or game, since they carry with them the significant acidic edge of the fresh fruits, making them the perfect foil for strongly flavored meats that benefit from a bit of sweetness with they're served. Currants can also be dried. The best way to dry them yourself is to use a dehydrator. How Free Is Free-Range Chicken?